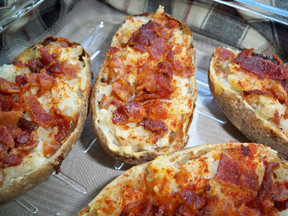 Twice baked potatoes stuffed with bacon, onions, cheese, and sour cream. Goes great with grilled steak, pork chops, or chicken. Scoop out pulp of potatoes, leaving skins intact. Mash pulp. Sauté onion in 3 tablespoons of bacon grease. 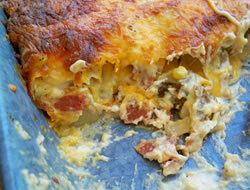 Combine pulp, crumbled bacon, onion, cheese, sour cream, salt and pepper. Stuff skins with this mixture. Sprinkle with paprika. 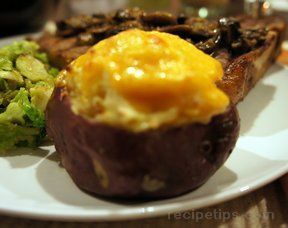 "I made these potatoes last night for my husband and myself to go with our steaks. 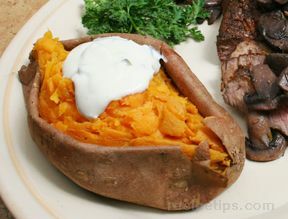 Seemed like a lot of stuff to put into 4 potatoes but they weren't too bad. My husband thought they were great. I left the onion out of some because I don't like onions."